Teaching is a complex process that includes many intangible or invisible behaviors, i.e., preparing, researching, caring, listening, observing, reflecting, and collaborating—all which have come to be known as facilitating, that is--”to make possible.” Thus, representing what an educator does visually or for the purpose of documentation and assessment is mostly about the concrete aspects of teaching--what students produce, from their completed work to reading and mathematics test results and does not represent those intangibles. It follows then that I am not visible in the images below. Rather, the work of my students and the programs I have developed are highlighted and emblematic of some of the many hats I have worn as educator and administrator, i.e., Consultant, College Instructor, Program Developer, Editor, Presenter at Conferences, Curator of Exhibitions, and Elementary School Art Teacher. Beginning with a given image allows the teachers to break through the impediment of the blank paper. The exploration of cross-cultural themes like "sky" in a variety of media becomes a vehicle for the introduction of art concepts as they relate to that particular topic. Formal issues like color, for example, become meaningful to students in the context of the project’s subject. One of the three major projects in the course that were designed to draw out each student’s personal narratives. It was inspired by the artist, Jennifer Bartlett’s, In the Garden (1982), her year-long painting project in Nice, France. The project consisted of a semester-long series of pieces on the same subject chosen by the student. Erika Schroeder Verik, Christan Moy, and Sarah Byrne Schettig completed their theses in 2012 under my supervision. Ordinarily each thesis student designed an exhibit, representing the subject of her thesis visually. As a result of the bond the four of us had developed in our year of working together, we decided to collaborate on one exhibit that would exemplify the complexity of the relationships between the three thesis subjects. After what seemed like a long period of brain storming, we decided to use a mapping program called IOGraphica that Erika suggested could plot those connections. E. M. Forster’s thematic phrase, “Only connect,” in his novel, Howards’ End, seemed the perfect correlative for the map that we designed of our work together. Students were first asked to draw a cat from their imagination; then from observation; and finally, in the style of another artist. They had to choose from a limited number of black and white materials and paper (including its size) as well as their vantage point to the cat. In the concluding discussion, most of them felt that they needed visual references to represent what they saw. I pointed out that in many art classes, children in elementary school are asked to draw from their imagination; when this proves difficult, they are convinced that they are not “talented” in art. 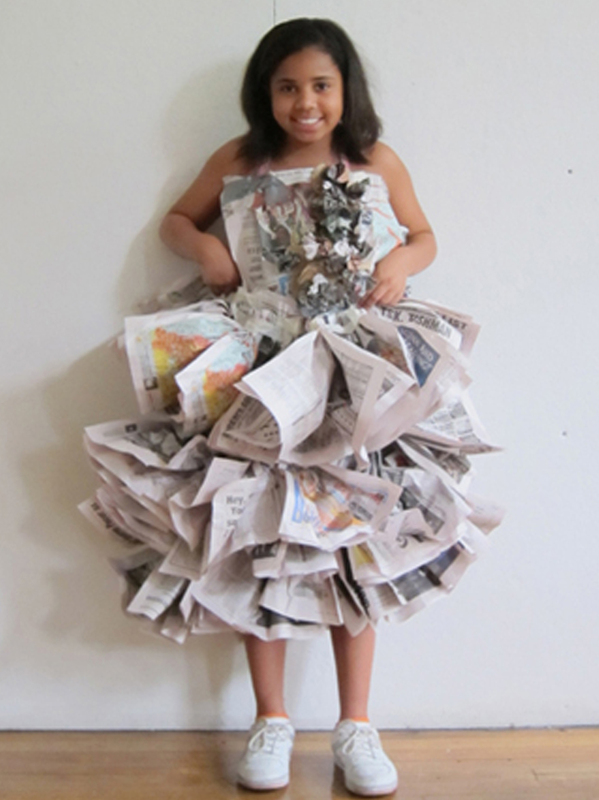 Arts education in the United States does not typically include the study of design. Students often graduate from high school without knowing what an industrial designer does or how an architect works. Career possibilities in the design disciplines are ignored and most arts programs for children here in New York City (known as a center for design professions) do not offer classes in design. 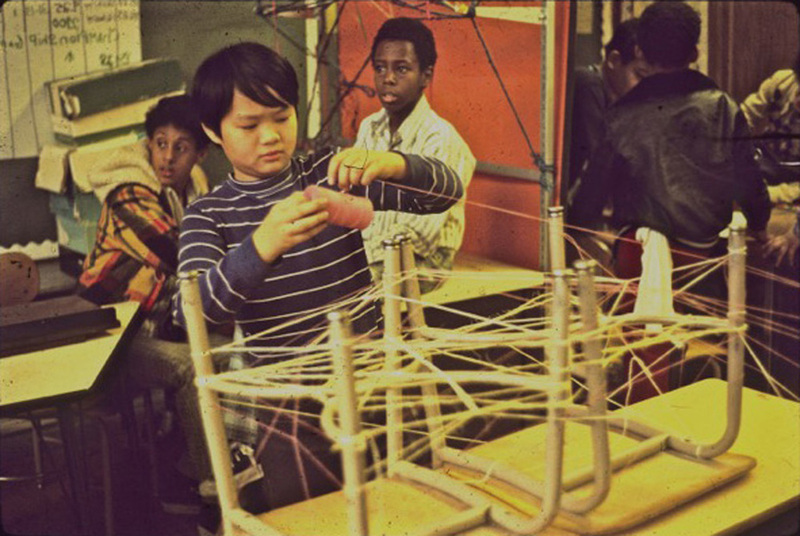 The Summer Design Program was held at the Beginning with Children Charter School and introduced approximately seventy New York City public school children in Williamsburg, Brooklyn to the fields of interior design, architecture, fashion, textile, and graphic design. This performance with puppets standing in for Jodi Kushins, friend and former Pratt graduate student, and myself, was presented at the 2007 NAEA conference in NYC. It centered on our long distance telephone conversations concerning our professional accomplishments and challenges as artists, teachers, and Jewish female, New Yorkers. 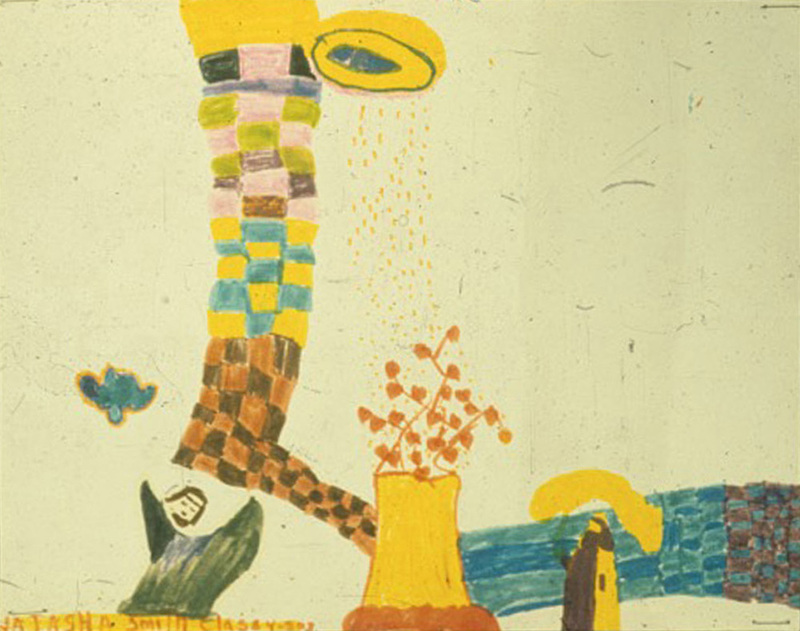 Gayleen Aiken’s few art lessons, taken when she was much younger, provided a readymade technique or schema for reproducing the many important rectangular structures in her world—the piano, organ, nickelodeon, granite quarries and shed, and old, big country houses. She used these techniques and several other “How to draw” schemas to give shape and permanence to the good, old times she remembered. The Chalk Talk exhibition, co-curated by Kelly Valletta and myself, was borne in the Foundation drawing classes of Pratt instructor, Brian Brooks, who always had a black/green board filled with complicated diagrams and instructions mapping out the day’s lesson for his classes. His boards recall the drawings of Rudolf Steiner, Joseph Beuys, Cy Twombly, and Keith Haring, artists whose work was included in the exhibition. For this project, I had to decide how 36 children could share one hundred markers. This limitation was liberating rather than an impediment to planning. It served as a jumping-off point for a lesson in which shared markers became part of a game and I was an active collaborator/player. While the children drew each emerging element in the story, I was able to guide their compositions. One of several rules of the game was that they had to use colors from their imagination rather than “local” color. This collaborative project led to a series of lessons that included Rapunzel, and The War of the Bugs, in which the paper became a field the children were looking down on and dots of different colors and sizes represented the various bugs doing battle in my story. An afterschool project in which the students were given choices, i.e., how they wanted to work, in a group or alone; the furniture in the room they would turn into a loom for weaving; and the materials with which they would weave. This was what “real” artists did—they thought a lot before they began working and made lots of decisions rather than always working alone at the same table, easel, or spot on the wall. And just as artists didn’t always make art that was permanent, the students' weavings would only exist in the paintings they did the following week.